NOTE: I was moved to write this article due to a recent fatality on February 8th, 2018 at an unguarded level crossing at Breslau ON. The incident involved a VIA Rail train. Five years previously there was another fatality at the same crossing, also with a VIA Rail train. When a fatality occurs involving passenger trains many people are affected. These include: the deceased person(s), their friends and families, the train crew and passengers, first responders, and even the general public. The reality is that human error is usually one of the main contributing factors to fatalities that involve passenger trains. Our neighbours in the United States have experienced recent tragedies involving fatalities on Amtrak and Brightline Florida passenger rail services. These incidents highlight the need for changes. In Ontario, the situation is much the same with a shocking number of preventable passenger rail related accidents. Below is a list of fatalities involving VIA Rail in 2017. This list does not include GO Train related fatalities. Add in the previous multiple fatality accidents - September 18, 2013 - Ottawa Bus/VIA Rail, and February 27, 2012 - VIA Rail Burlington - and it obvious that solutions need to be implemented to prevent these from happening again. What is the current situation in Ontario? Toronto-Ottawa -VIA Rail is pushing a high frequency rail line that has mostly level crossings. VIA Rail refuses to release detailed plans of the route, but these trains will probably be running through the small communities that the line previously ran through and will create hazardous situations for residents. Remember: level crossing fatalities happen even if you have lights and crossing arms. VIA Rail’s high frequency rail is a cheaper less safe option than true high speed rail. Southwestern Ontario - People are objecting to high speed rail plans between London and Toronto, even before anyone even knows where the route would go or how it will be built! Some people are suggesting other solutions, without any evaluation of risk. For example, some people have stated that they should just put more trains on the existing lines through the towns and cities through which VIA Rail currently runs. More frequent trains, shared tracks with freight trains, and multiple level crossings will result in more fatalities. History has proven that fact to be true. The best method to control any hazard is at the source. So if trains and autos can collide at an intersection, eliminate the intersection and you eliminate the hazard of a train/auto collision. The high speed railway companies in Japan figured that out over a half a century ago. Their trains are grade-separated from freight trains and roads. The result of this decision is that their Shinkansen (bullet trains) have never had any fatalities since they started operation in 1964. True high speed rail should be built in the London-Toronto corridor with grade-separated tracks. Some passenger rail accidents in Ontario and the United States involved an engineer error in that the train was going too fast in sections of the line where reduced speeds were in place. Near misses also happen. On September 5, 2016, A Via train travelling from London to Toronto on Labour Day missed a red stop signal meant to prevent a collision with a GO Transit train. Luckily no accident happened. The corridors they are referring to are VIA Rail’s existing main routes. But where are we in implementing these control systems in 2018? In Canada, the government does studies and then more studies and talks about methods of accident reduction like Enhanced Train Control (ETC) Systems. A basic ETC system, for example, might include a static display of track infrastructure, speed limits, and operating restrictions, but provide a dynamic display of current train location. This type of system could be designed for high reliability and provide audible or visual alarms for the operator without positive enforcement. There are a variety of ETC systems being used in the USA and Europe. In Canada we have no standardized modern safety control system on our freight or passenger rail. VIA Rail is in the “development stage” of a GPS Train, an in-cab engineer-assist system for use in Canada, which - if ever completed - is less effective in preventing accidents than the Positive Train Control (PTC) system being mandated in the USA. There is no federal legislation mandating any PTC safety systems in Canada. In the USA, the government has acted by implementing legislation to ensure that PTC Systems are being installed on track where the Amtrak trains run. The freight rail lobby has been pushing back for extended deadlines. Recent Amtrak train crashes have made tightening up these deadlines critical to improving safety for Amtrak trains. What is PTC? Positive Train Control, a system that will automatically stop trains before certain types of accidents can happen. a safety overlay system on the existing signaling and train control system that is designed to prevent accidents caused by human error. Ironically CN and CP Rail in the USA must implement a PTC system but in Canada there are no such requirements. 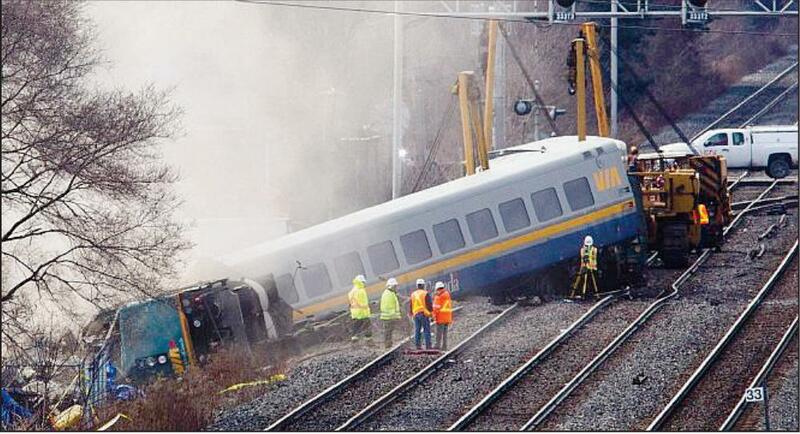 Can the accidents such as the VIA Burlington rail tragedy in 2012 happen again? Yes, that type of accident can happen again as our government, VIA Rail, CN and CP rail continue to ignore any safety standardization or regulations to prevent these types of accidents. We demand that Transport Minister Marc Garneau and the federal Liberal government introduce legislation to mandate PTC on track that VIA Rail runs on as per recommendation R13-01. Passenger rail safety must be a priority in Canada. Wah? You are talking about grade crossing accidents and pedestrian strikes, which are not preventable by PTC. There is a great deal of data to support PTC, so why use accidents PTC would not have stopped? You are undermining your own argument. "Toronto-Ottawa -VIA Rail is pushing a high frequency rail line that has mostly level crossings. VIA Rail refuses to release detailed plans of the route [...]". This is a theme of yours - that VIA refuses to release "detailed plans" of their proposed high frequency service through Eastern Ontario. That's probably because they don't have any detailed plans to release. Has VIA undertaken a detailed route planning study? No. Has VIA carried out an environmental assessment? No. So the thing you're demanding to see in all probability *doesn't exist*. At this point in time it's little more than notional. "Southwestern Ontario - People are objecting to high speed rail plans between London and Toronto, even before anyone even knows where the route would go or how it will be built!" OMG! People are objecting to something before anyone even knows where the route will go or how it will be built! Good thing the author of this article isn't doing the exact same thing with respect to the HFS in Eastern Ontario because that would be hypocritical and intellectually inconsistent.